This is part 1 of THE INUYASHA SPECIAL, aired on 9 April, which counts as episode 21. 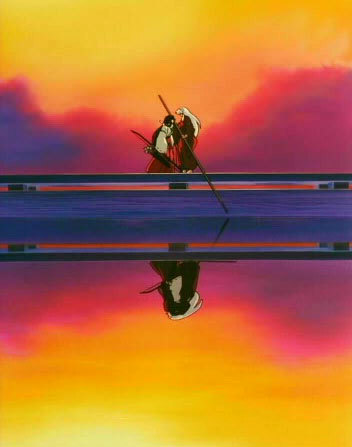 Fifty years ago, someone set a trap, making Inuyasha and Kikyo hate each other. We finally found out that it' was Naraku's scheme. Why did he do that? What was his motive? Who is he actually? The angry Inuyasha wants to avenge Kikyo and cuts through Naraku's miasma to finally reveal his true identity. Next episode, 'Naraku's True Identity Unveiled'! How dare you?! You tricked us! You tricked Kikyo and me into trying to kill each other! Then let me ask you… Was the trust you had in each other so easy to destroy? The truth in that anger… Bitter anger set you against each other. That is the true legacy of the trust you had for each other. Kikyo could not understand. I'm not sure of this, but on the big TV screen in the street, it seems to be a spoof of the movie Titanic, when Leonardo DeCaprio held Kate Winslet on the deck of the ship. This is probably the only time we see Ayumi and Yuka in casuals and not the school uniform. …the restaurant (where Kagome and Hojo were eating) was playing a synthesized version of 'My Will' by dream (ending song)? This is rather apt as they changed the ending song for this episode. The telephone rings in the Higurashi house. GRA answers. The screen splits and Yuka appears on the left side. Yuka: Oh, Kagome's grandpa! Hello! GRA: Is that you, Yuka? Why hello. Yuka: Umm… Is Kagome home? GRA: (gravely) Well… Kagome pulled her back again and took to her bed. Yuka: (worried) Pulled her back? The screen reverts and KAG appears next to GRA. KAG: (frowns) Who pulled her back?! (snatches the phone) Give it to me! A while later, the phone rings again and GRA answers. The screen splits and Eri appears on the left side. Eri: May I speak to Kagome please? Eri: (shocked) Huh?! Has she been hospitalized again for tests? KAG appears and snatches the phone. The screen reverts. The phone rings again. Ayumi appears on the left side of the screen. Ayumi: Beriberi and rheumatism and neuralgia? GRA appears on the right side of the screen. KAG appears and snatches the phone. KAG: Will you cut it out, Grandpa? Why would a girl my age get neuralgia and rheumatism?! GRA: (worked up) I don't want to tell lies, either! I'm just helping to explain your absence when you go off to the Feudal Era! (folds his arms and says firmly) And what I'm saying is valid! KAG: (angry) No way! I'm right here today! GRA: Huh? Oh yes… Kagome, what's the matter? You usually rush off over to the other side on weekends. That's why I made up those illnesses. SOT is playing video game in the living room. It is a fighting game. SOT is engrossed. KAG walks past and stops by the door. KAG: Sota! Playing games from morning again? The weather's great, so go outside to play. Flashback from previous episode when Hojo asked KAG for a date. Hojo: Will you go to the movies with me on Saturday? Hojo: It'll be a nice change from studying. Cut to Yuka whispering to KAG. Yuka: You're in love with someone else, aren't you? Back to present. Close up of the TV screen. SOT's player is thrashed. SOT's player: How could I…? KAG walks in the courtyard, about to go out. She stops by the Dry Well. Flashback from previous episode when INU fought RYO. INU: (leaps and swings TET) Shaddup! RYO clasps TET's blade with his two big hands and throws INU aside with it. INU winces as he hits the ground. MIR: Inuyasha denied it, but he's not back to full strength. INU: How come he's so strong?! The Sacred Jewel necklace falls out of INU's clothes. RYO runs to it. RYO: A huge Sacred Jewel fragment! An orange furball suddenly appears and grabs the jewel and sprints away. SHI: You can't have it! The wolves runs after SHI, who shrieks in terror. Back to present. SHI sprints across a forest. The pack of wolves are chasing him and cutting close. He reaches the Dry Well and somersaults. The wolves stops and close in on SHI. SHI: Time to show them my… (leaps and throws a bunch of leaves in the air) Split Image! The leaves turn into puffs of smoke which dissipates into images of SHI. The wolves attacks the SHIs, but they pop back into smoke. The wolves look around, confused. SHI appears on the top of the tree that INU crashed into the well in the previous episode. SHI: Now's my chance! (slides down the trunk and into the well) You fools! SHI chuckles proudly as he slides down. He hits a branch suddenly and falls downwards. He hits the ground head first. The Sacred Jewel necklace falls out of his clothes onto the ground. It glows. KAG is walking down the steps of the Higurashi shrine. She halts and turns around. KAG: (thinking) What is that? It's slight, but I feel the presence of the Jewel. Inuyasha! She runs towards the Dry Well and looks into it. KAG: What's going on?! No one's here! After I came back all the way here! (looks at her watch) Oh no! The time! (shrieks) I'll be late! INU is fighting off the pack of wolves while MIR fights the poison bugs. INU claws at an oncoming pack of wolves and slays them. RYO attacks INU and he dodges. RYO then sweeps INU with his other hand and INU is sent sliding across the ground. MIR: He usually fights back so easily! KAE: His slow movements aren't simply due to his injury. KAE: It's Kagome. Without Kagome, he's unable to realize his true power. MIR: Royakan definitely is using the power of the Sacred Jewel. MIR: Find where it is, and you can defeat it! KAE: Kagome would know its weak spot where the fragment is hidden. INU: (thinking) Forget about her. Kagome's not here anymore! I closed up the well which connected her world to ours. Sh-she will never return here again! (stern) We cannot involve Kagome in these dangerous battles! RYO spews a pack of wolves from his mouth. INU swings his claws. Fade to modern Japan. KAG and Hojo are dining in a fast food restaurant. KAG sips her drink angrily. KAG: (thinking) Cripes…he gets me so mad! He always interfered when I had a test and was cramming. Hojo: (concerned) Higurashi, what's the matter? You look so angry. KAG: (smiles) Huh? I-I'm sorry. (thinking) That's right. I'm on a date. Why am I thinking of that fool at such a time? (to Hojo) Err… What were we talking about? Hojo: Aren't you forcing yourself? KAG: (thinking) Forcing myself? I keep thinking about him…am I being too proud? (to Hojo nervously) Oh no…no such thing! Hojo: I can sorta tell. KAG: Hojo… I don't… (thinking) I don't think anything of him. Hojo: I'll bet you don't feel well, but you forced yourself to come. (KAG falls to the ground) Your grandfather said you had gout. KAG: (struggles up, thinking) Not even to Hojo too…! Do I look sick at all?! That's right… Maybe Inuyasha's wound hasn't healed. Oh no… What if he's dead?! Cut to bird's eye view of the streets of Tokyo. KAG: (voice-over) Sorry, Hojo! Ask me out again. Good bye! Cut to KAG running towards the Dry Well. She throws her handbag aside and jumps in. KAG: (thinking) I feel it! I feel the Sacred Jewel. (feels the ground) I can't see it. Where? Where is it? Fade to SHI in the Dry Well in the Feudal Age. The Sacred Jewel fragment on the ground next to him glows. SHI regains consciousness. The wolves peep into the well from above. SHI: (panics) They found me! Cut to KAG digging the soil with her hands. KAG: (thinking) I want to go back! Inuyasha, are you all right?! Suddenly, a pink glow appears. KAG reaches in and falls through into an abyss. KAG: (holds the Sacred Jewel fragment in front of her) This is… (thinking) The fragment of the Sacred Jewel! KAG lands on the Dry Well of the Feudal Age. SHI is shocked to see her. SHI's expression turn from shocked to glad to aggrieved. SHI: (leaps into KAG's arms) Kagome! KAG: (hugs SHI happily) Shippo! SHI: (worked up) Kagome! Kagome! KAG: (glad) I was able to return! They suddenly look up. A wolf has climbed down the trunk into the well and growls at them. Back to INU, MIR, KAE and RYO in a stand off position. INU: (gasps and turns around) I smell Kagome! KAE and MIR look at INU. INU runs off. INU: I'm sure of it! Kagome is here! INU: (jumps and punches RYO in the face) Shaddup! Don't…get in my way! INU slashes RYO's chest with a transformed TET. RYO falls backwards in pain. MIR: (shocked) He's suddenly much stronger! MIR: (yells) Hey! At least deliver the fatal blow! RYO trudges towards MIR angrily. MIR runs off. INU sprints towards the Dry Well. Cut to more wolves entering the well. SHI: Inuyasha's wound isn't fully healed. The enemy is taking advantage of that to attack. KAG: (worried, thinking) I knew it… He's in danger. Two wolves reach the ground. KAG & SHI: They're here! A wolf leaps towards them. Cut to INU grabbing the tree trunk in the well and pulling it out with all his might. He pulls it out and is thrown in the air from inertia. The wolves whimper as they fall off the trunk. RYO reaches the well and growls. INU swings the tree trunk in RYO's direction and throws. The tree strikes RYO in the mouth and he falls backwards. He collapses and lose consciousness. The wolves around him dissipate into thin air. As INU is landing, he turns around towards the Dry Well. KAG and SHI climb out of the well. Soft music plays as INU and KAG look at each other. INU lands. KAG walks towards him slowly. INU stares at KAG in silence for a moment. INU: Silly fool! W-why'd you come back? INU is taken aback as KAG runs towards him. KAG: (dives into INU's arms) Inuyasha! (hugs him tightly) I thought you died…because you didn't come for me! INU: I told you not to come anymore! KAG: I can't help it! I longed to see you! KAG: What's that look? Didn't you want to see me, too? How dare you?! I was so worried about you… What a fool I was! (lets go of INU and buries her face in her hands) You don't understand a thing! INU: (nervous) H-hey! Are you crying, Kagome? Don't cry over such a trifle! KAG: (yells) I'm not crying out of sadness! It's frustration! SHI: They fight the minute they set eyes on each other. (relaxes) But thank goodness it's all over! MIR and KAE arrive at the scene. MIR: Kagome has returned! Priestess Kaede, it's Kagome! Priestess Kaede…? KAE: (looks in the distance) Monk, don't you think it strange? KAE: The droves of poison insects have disappeared. NAR appears among the trees nearby and looks at KAG. NAR: That girl… Kikyo? No, it can't be. Kikyo… That woman died fifty years ago. KAG helps SHI out of the well and stops suddenly. KAG: (thinking) W-what is this presence? (turns around and says) Someone's here…who possesses the Sacred Jewel fragment. MIR and INU look at her. MIR and INU run in the direction that KAG was looking. NAR turns around. INU leaps and lands in front of him. INU: I knew you were nearby. You are Naraku! NAR smirks. MIR arrive at the scene. INU: I've got you now! KAG, KAE and SHI reach the scene. INU: Before I kill you, I must ask you one thing… What grudge do you have against me? NAR: Grudge, huh? (laughs) I guess you can't die in peace not knowing why someone hates you so much. NAR: Kaede, huh? (laughs) My, my… How old you've grown. KAE: You know me? I knew it… You are… Onigumo! NAR: Onigumo… Such a nostalgic name. I, Naraku, am not Onigumo. Cut to a snake leaping off a tree and into the river. It swims along the river. NAR: (voice-over) But it is true…that fifty years ago, I was borne out of Onigumo. Cut to flashback of KIK tending to ONI in a cave. NAR: (voice-over) Onigumo was a foolish man. He began to desire the kind-hearted young priestess who nursed him. ONI looks around wildly. KIK leaves the cave. A horde of demons appear and surround the immobile ONI. ONI: Even my rotting soul is worth something… Want a taste of me? Hungry for me, aren't you? I want a body that moves freely in order to possess the Sacred Jewel and Kikyo. Now eat me! Devour me! And in return, give me power! The demons envelopes ONI. Thousands of them enter his body. NAR: (voice over) That is how…many demons became one…into Naraku. Cut to image of NAR in a baboon suit against a black background. NAR: (voice-over) Creating my body took countless demons. Cut to image of KIK and INU (on a Sakura tree) looking at each other. NAR: (voice-over) Because the priestess had been reduced to a powerless girl, this region teemed with demons. All because the priestess…Kikyo…had fallen in love with a worthless half-demon. Cut to INU and KIK taking a boat trip. While getting up a pier, KIK trips and falls into INU's arms. They hug. NAR: (voice-over) She gave in to childish desires…tried to use the power of the Sacred Jewel and was punished. Inuyasha, you experienced the punishment yourself. Cut to KIK firing several arrows at INU. INU turns and looks at KIK in shock. KIK: (in a voice of both KIK and NAR) Die, Inuyasha! INU: (angry) How dare you?! You tricked us! You tricked Kikyo and me into trying to kill each other! NAR: Then let me ask you… Was the trust you had in each other so easy to destroy? NAR: The truth in that anger… Bitter anger set you against each other. That is the true legacy of the trust you had for each other. Kikyo could not understand. Instead of choosing death, she should have clung on to her life and used the Sacred Jewel. Had she pleaded for her life, her wretched wish would have been easily granted and she would have understood the ultimate truth of darkness. Such a foolish woman. The Sacred Jewel grows even more beautiful when it is tainted. INU: (clenches his fist angrily) Kagome! How many fragments do you see inside him? KAG: Sacred Jewel fragments… Ten… No, twenty… No, much more! INU: Hey, Naraku… I'll show you what tainted is! I'll make that tainted blood of yours flow! INU dashes at claws at NAR, who leaps into the air. NAR's baboon suit falls apart and a man in purple-blue haori is revealed. He holds up a hand to cover his face. NAR smirks and purple fumes rush out of him. The fumes envelope the entire forest and the trees start to rot. MIR, SHI, KAE and KAG run away. MIR: A miasma! Get away! Both NAR and INU land. NAR: (hair covering his face) So you've sunken into my miasma. INU: (struggles to unsheathe TET) Tetsusaiga! TET transforms and a whirlpool of purple fumes twirls around INU. INU leaps and slashes NAR's back with TET. NAR's clothes is cut into pieces, revealing a spider-shaped burn mark on his back. A vortex of miasma emits from NAR's feet and envelopes him. INU struggles to hold. The vortex of miasma slowly dissipates to reveal a hole in the ground. INU: He escaped… (shaking in anger) That damned Naraku got away! (yells) Damn it! Stay and fight! KAE and MIR are talking to each other in the forest. MIR: Yes. According to Inuyasha, a spider-shaped burn mark on his back. KAE: The robber Onigumo had terrible burns. Perhaps that is proof that it is Onigumo. MIR: (looks at his right hand) A spider on his back… That will also be the telltale sign of Naraku. Miroku’s Priestess & raven webb at Access: Inuyasha forum on 06 Feb 2008.